The Mendocino coast is known for its dynamic water. Miles of rock gardens filled with pourovers and slots, surf breaks around every corner, and lots of large swell to fill it all up. But every once in a while the swells go away. We're left with nearly flat ocean conditions. And when it's also sunny and calm, you need to take advantage of it. This past weekend we had short period swells under three feet. That translated to less than a foot of surf in on some of the beaches. So it was time to explore places you can't normally get to, and time for even the timid to start playing around the rocks. On Saturday we went to Russian Gulch with a group of friends from the Sacramento Sea Kayakers. Most people were in short boats - some for the first time - and we got the chance to play around the outer rocks. Heading north towards Caspar is a series of tunnels and arches that allow you to explore while being protected from the swells. That protection comes from a line of outside rocks and take the energy of the day. Since this day had such little wave energy, we could actually explore the outside rocks, going wherever we wanted. We still found some nice pourovers and slots. The occasional bigger set would come through and give everyone a little ride and excitement, but it was always gentle and forgiving. I was even able to climb out on the rocks to get some closeup shots.We didn't go very far, but it was a lot of fun. The next day we went further south. We left the short boats and took our sea kayaks to Navarro. The beach is steep and dumpy, but with one foot waves it was an easy launch. After Cate dropped some crab pots we headed down towards the town of Elk, playing in every nook and cranny along the way. And there were lots of nooks to explore. Lots of tunnels that went through to secret lagoons, lots of caves that disappeared in darkness, and more rocks to paddle around then we had time for. There were multiple rocks with multiple arches and again, plenty of sunshine to see it by. The visibility in the water was just as good, and almost the whole time we got to watch the garden of the sea pass under us as we made our way along the coast. It's a beautiful stretch and normally requires a lot of work to reach, but this day was a walk in the park. We finished the weekend with some fresh caught abalone (thanks, love!) and lots of gear cleanup. I'm sure we'll be getting more winter storms soon, and we'll enjoy the surf and excitement that comes with them. But it will be nice to hold the memory of a warm, flat weekend and the special places along the coast that are seldom visited. My gear reviews tend to get a lot of hits. That makes sense - people like to know what others think of specific gear. But the truth is, most people don't try to understand enough about gear in general. 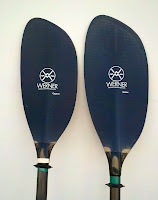 Instead of wondering if the Werner Shogun is the best paddle ever, you would be better off understanding how the different paddle attributes relate to what you paddle, how you paddle, and your goals as a paddler. So in that light, I want to talk about paddles in general (with some specific examples) so that people can make their own decisions instead of worrying so much about what other people think. 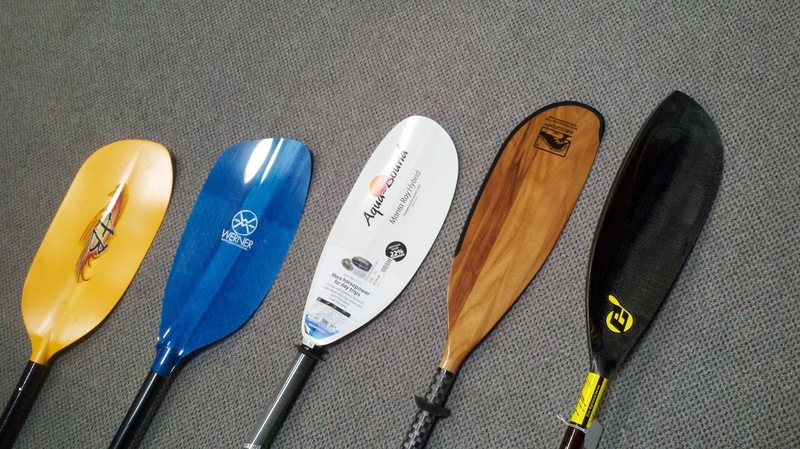 Like all paddling gear, paddles have competing characteristics. What makes it good at one aspect of paddling is exactly what makes it bad at another. 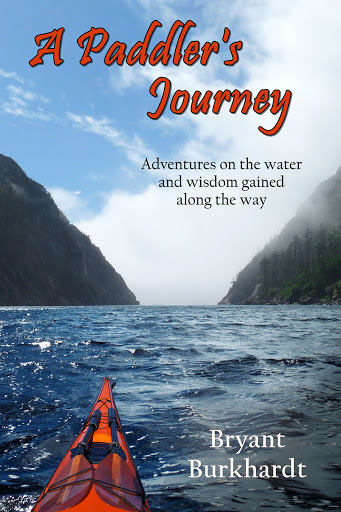 So understanding what you want in a paddle is the first step in getting the correct paddle. I'm going to stick with the basics and the more common Euro paddles - I'll leave Greenland sticks and Wing paddles for another time. Let's start with size since everyone know's that's what really matters :). Paddles come in different lengths. In general, taller people will want longer paddles. But ideal size depends a lot on technique and type of paddling. For dynamic paddling, whether in the ocean or on the river, most people use shorter paddles. Shorter paddles work better with more vertical strokes (which give more power but also use more energy). Longer paddles give more leverage and work better with lower angle technique. Shorter paddles give quicker acceleration while longer paddles often work better for maintaining speed. Bigger is not always better. The other main size consideration is the blade size. I think most people use blades that are too large. A large blade really anchors in the water and it often feels like you get a good grip. But unless you have a lot of strength, or a lot of weight you need to push, that large blade is going to be much harder to pull on. It will accelerate slower and strain your body more. Don't judge a blade on how a few strokes feel - paddle with it for a day and see how your body feels at the end. Again, bigger not always better. There's also the blade shape to consider. 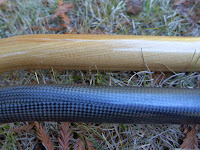 Blade shape should match your paddling style and technique. 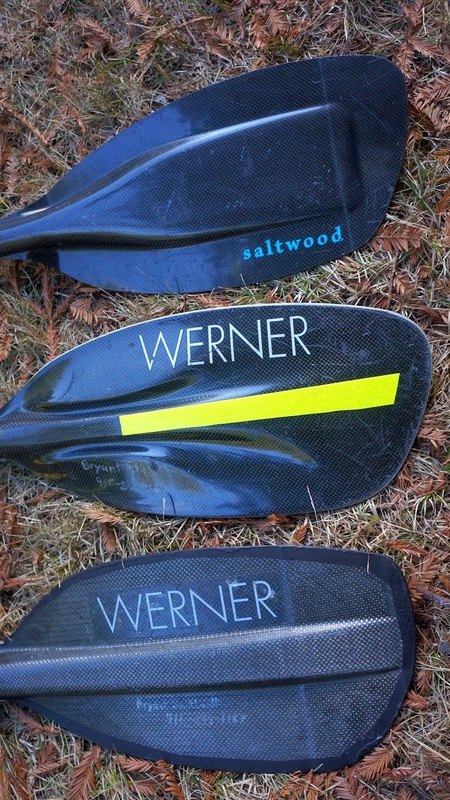 The simplest way to break it down is that long and skinny blades work for low angle paddling, while shorter, fatter blades work for high angle styles. 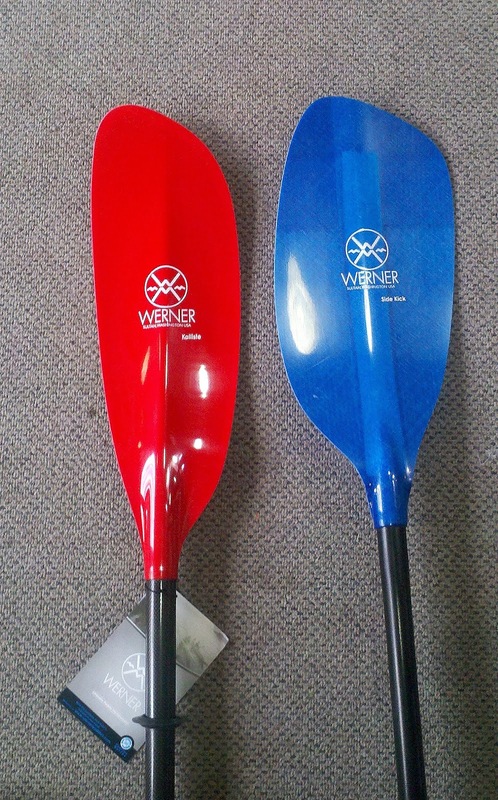 There has been a big trend for sea kayakers to use high angles paddles, especially those paddling more dynamic water. But the truth is that most of those people, most of the time, are still using a low angle paddling technique. Some paddles work okay for multiple angles, some are more specific in where they work. In whitewater it's almost all high angle designs, with the added option of downturned blades. Downturned blades come from the slalom world and work well for folks with good technique and very high angle strokes. To each their own. Paddles also come in different materials and different weights. The most important thing to understand is that lighter paddles are not as strong as heavier ones. You'd think that would be obvious, but people who snap ultra lightweight sea kayak paddles when playing among the rocks always seem so surprised. There's a reason that whitewater paddles weigh 50% more than sea kayak paddles in spite of being smaller. 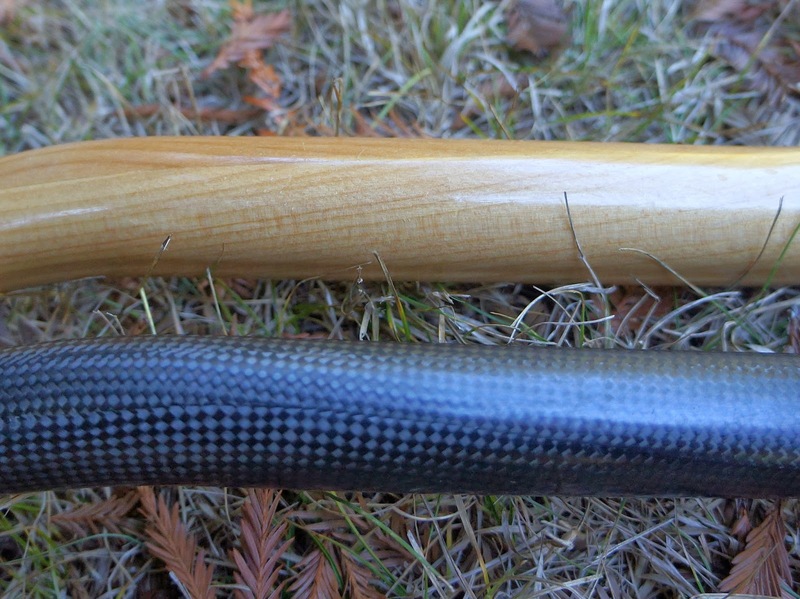 Carbon does give you a lighter weight for the same strength when compared to fiberglass, but it's also stiffer. A stiffer paddle can be more responsive but it also puts more stress on your joints. Wood is generally heavier than composites, but it also has more flex, more buoyancy in the water, and feels warmer in cold weather. Plastics are heavy and flexible, often to a degree that really impedes their performance. But plastic can be very durable and inexpensive, characteristics of importance to some folks. Lighter isn't always better. Another material question is foam core blades. Foam cores give paddle blades more buoyancy and that results in a lighter swing weight (what you feel while paddling). They can also help (minimally) when rolling or bracing in aerated water. But the thicker blade does have a different feel in the water - I've found that they don't 'grip' as well until they're fully submerged. That's not an issue if you have good technique and are taking purposeful strokes, but that's not always the case in real dynamic environments. The other thing to be aware of is that foam cores are not quite as tough as solid composites - they can be punctured and while they are stiff they lose a little strength. Pick your poison. Between the blades lies the shaft. Lets talk about straight vs. bent. The idea behind bent shaft paddles is to put your wrists in a more neutral position. That's undoubtedly a good thing. If you have wrist or forearm problems, the bent shaft can reduce strain and ease carpal tunnel syndromes. But some people don't need it. A straight shaft is lighter and stronger (and cheaper). The main thing to know is that switching from one to the other will take some adjustment time. Give yourself several paddles to decide what works best. 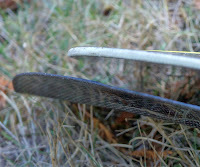 And realize that not all bent shafts are the same - some just feel better than others. Test 'em out to find your fit. Finally, lets talk thickness. My thoughts have evolved on this. Standard thought is that smaller hands should use a thinner shaft - less strain on the hand. But I had an interesting discussion with a paddle designer who said the research says there is less muscle strain when hands grip an object that fills up the hand compared to smaller diameters. After trying his paddle for a couple days (it being thicker than what I'm use to) I had to agree. I was surprised, but I actually felt less fatigue. This is another instance where first impressions often fail - the larger paddle always feels a little awkward when I first grab it, but after a few minutes of use I forget about it and at the end of the day my hands feel better. Don't be afraid of the large. 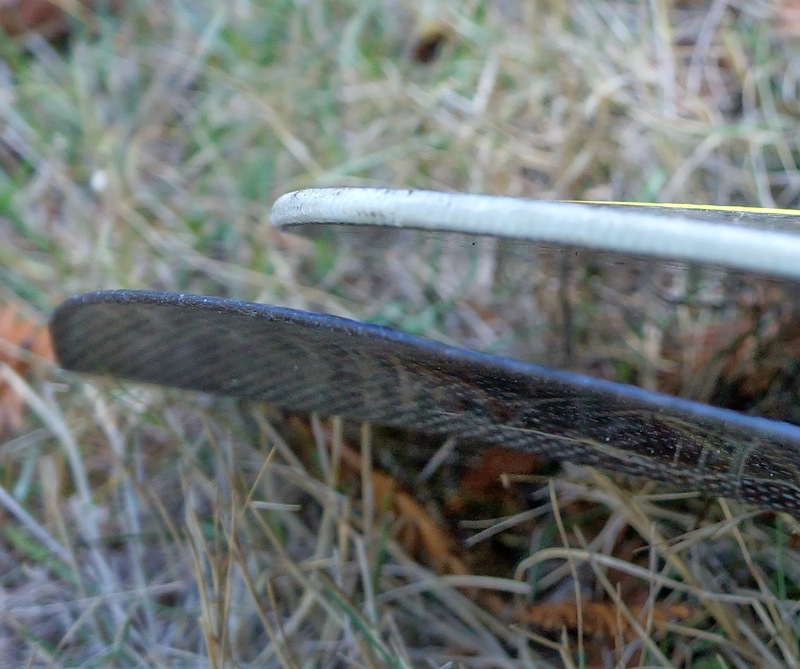 There is more to talk about with paddles, more material/shape/swing-weight issues. But I've rambled enough. This should get you started. If you have any specific questions on paddle design please leave it in the comments. If you're curious, others out there will be as well.